RALEIGH (Aug. 4, 2015) – A bond proposal unveiled Monday by state House leaders improves on a plan offered by Gov. Pat McCrory, devoting more than $900 million in bonds to University projects and $300 million to community college projects. House Speaker Tim Moore said the proposal – which would be put to voters in November – would take advantage of historically low interest rates. Many analysts expect the Federal Reserve to begin raising rates in September. Where McCrory proposed in April to devote $500 million to University projects and $200 million to community college projects, the House proposal raises those amounts significantly by using cash to pay for transportation projects and shifting bond dollars to Universities, community colleges and K-12 public schools. Unlike the governor’s proposal, the House plan supports projects at every state university – and even a new western campus for the NC School of Science and Mathematics. It also includes $85 million for a Plant Sciences Building to be shared by NC State University and the NC Department of Agriculture. 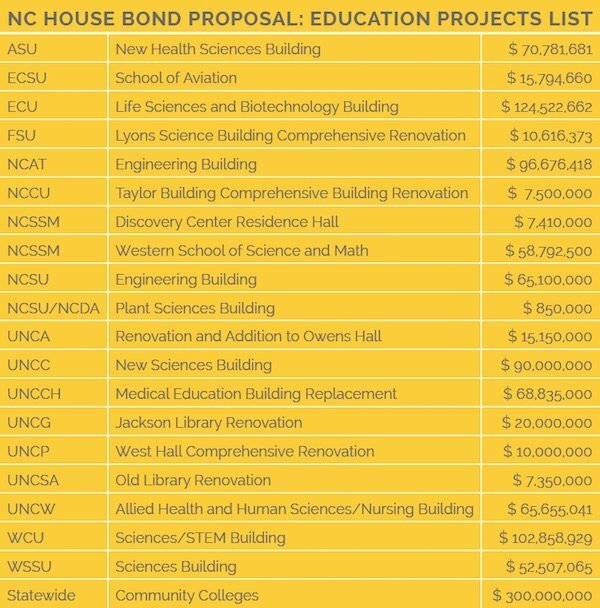 Where McCrory’s proposal focused only on new construction of new STEM-related buildings, the House proposal would include renovation of existing structures at UNC-Greensboro, UNC-Pembroke, the UNC School of the Arts, Fayetteville State, UNC-Asheville and NC Central University. The House plan, which was endorsed Tuesday morning by the House Finance Committee, comes closer than McCrory’s proposal to the $1 billion in new construction and $500 million in repair and renovation projects requested by the UNC Board of Governors. Rep. Dean Arp, R-Union, the measure’s lead sponsor, said the plan would not increase taxes. Arp said the state needs to seize the opportunity to issue bonds while rates remain relatively low. Each ¼-point increase in interest rates would cost the state $7.5 million over the life of the bonds, he said, and the interest savings outweigh the additional cost of holding a statewide election in November. “Time is money. And what we’ve seen is every tick up in interest rates costs us $7.5 million,” he said. Assuming passage in the House, the bond proposal would go to the Senate, where its fate is uncertain. Senate leaders did include $150 million for University repair and renovation projects in the Senate’s version of the state budget. Will they step up to support the growing needs of the nation’s 9th largest state?